Some months ago, I dropped into the offices at LSP.net for a chat and was surprised by a white board covered with interesting scribbles that hinted at the most fundamental change of design yet for the translation workflow management tool OTM. In the two and a half years I have used the platform, I have seen many positive developments, which have scratched off nearly everything on my initial wish list (with other plans that may take care of the few remaining items of streamlining for freelancers by sometime late this year or early next year), but I really didn't expect to see significant integration with translation environment tools except perhaps a bit of analysis log reading for quotation purposes. I was wrong. A few days ago, the official announcement of the integration plans for OTM and SDL Trados Studio hit my inbox, and discussions with the system's architect have made it clear that there's more ahead, though schedules are a bit vague at present. It's not clear from the post on the LSP.net blog, but the both the server and desktop (freelance) versions of SDL Trados will be integrated with the new middleware component, though there will be some differences in function. I'm not a huge Trados fan as much as I respect some of the developments in recent years, but I'm excited by hints that the online workflow tool may make it easier to use SDL Trados to generate project file collections not only for translators using Trados but for those with other tools as well. If this really happens, I think it will be a great boost for interoperability and reduce the perceived "bother" of working with translators who use tools with which the project manager may not be competent. Another thing that I like about the development plans for CAT integration with OTM is that the middleware component is actually vendor-neutral. This means that it can facilitate integration at the server and desktop level with more than just SDL Trados in the future. Where this may lead is unclear right now, but I think that the changes announced for memoQ version 6 for Microsoft Office file handling in the server API make that an obvious candidate, though the lack of a client API for memoQ still means that there is more potential benefit to Trados users. Although I'm quite encouraged by this new direction for my workflow tool, I probably won't use these functions myself, mostly because Trados is not my tool of choice for translation, though it is an important part of some of my preparation, data migration and terminology output workflows. 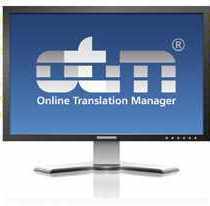 OTM has an enormous range of features - it's designed to run a medium-sized or larger translation agency with widespread global interests - and some of the presentations of this enormous range of functions can be quite intimidating. But like other tools I use that have many function - Microsoft Word and memoQ, for instance - I need only a small fraction of those functions for my routine work, and the underlying simplicity of the environment enables me to use the parts I need with great efficiency and security for my clients. And on those rare occasions when I need to work as more than just the Lone Translator, I can draw on whatever I need. The pace of development for OTM has slowed since I first became involved with it as the issues identified in the pilot phase were solved, often in some surprisingly useful and original ways. But the SaaS solution continues to grow in very practical ways, such as improved security, and its development is still driven by the same basic needs that led to its creation in the first place - the needs of its users to "punch above their weight" profitably in competitive project management.